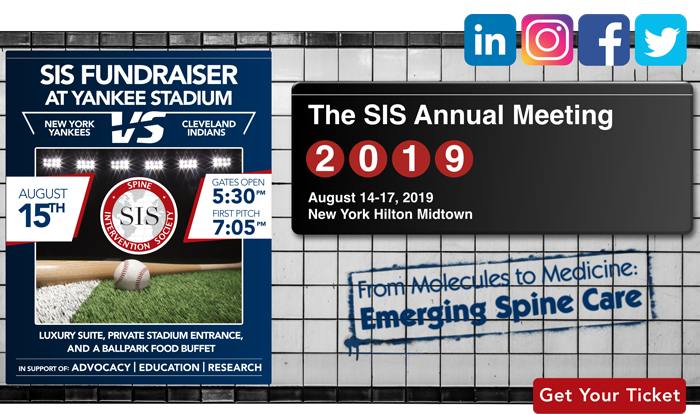 This summer enjoy a one-of-a-kind experience with your SIS colleagues watching the New York Yankees take on the Cleveland Indians from a luxury suite in Yankee Stadium. All-time greats like Yogi Berra, Mickey Mantle, Lou Gehrig, and Babe Ruth have worn the Yankee pinstripes. The ”Bronx Bombers” are winners of a record-setting 40 American League pennants and 27 World Series championships. And, the storied Yankee/Indian rivalry stretches back 100 years. Your ticket provides access to the SIS luxury suite to watch the game, private entrance into the stadium, ballpark food, and non-alcoholic beverages. All proceeds of this fundraiser will support SIS advocacy, education, and research. Yankee Stadium is approximately a 30-minute subway ride from the New York Hilton Midtown. Tickets are limited! Purchase yours before they are sold out!